CBI - China: Day 6 of 154 of the Japanese Invasion of Manchuria. Spain: Day 69 of 985 of the Spanish Civil War. Spain: Day 434 of 985 of the Spanish Civil War. CBI - China: Day 79 of 2,987 of the 2nd Sino-Japanese War. Day 42 of 106 of the 2nd Battle of Shanghai. Day 23 of 70 of the Battle of Taiyuan. Czechoslovakia: The Czech army is mobilized. Spain: Day 799 of 985 of the Spanish Civil War. CBI - China: Day 444 of 2,987 of the 2nd Sino-Japanese War. Day 105 of 139 of the Battle of Wuhan. ETO: Laws against German Jews keep growing, this time banning them from owning wireless radios. They face harsh measures if caught with one, whether or not they are tuning in to BBC broadcasts from London. Joseph Goebbels, head of the Ministry of Public Enlightenment and Propaganda, knew that radio was the most powerful and effective method of putting over any message the regime desired. The public had to leave home to go to the cinema while some simply did not read a newspaper. 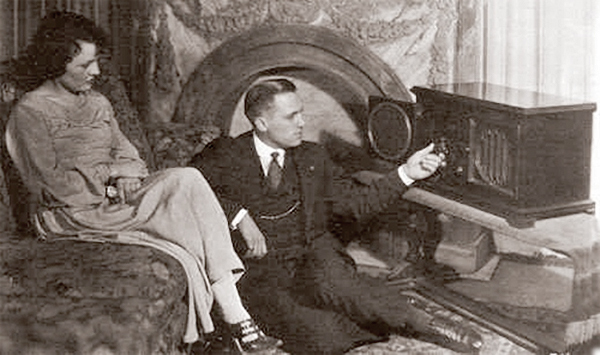 According to Goebbels, "What the press has been in the Nineteenth Century, radio will be for the Twentieth Century." The problem for the Nazis was that radio could be an equally effective tool for the Allies. Therefore, measures would have to be taken to purge German radio of influence opposed to the Reich. In regard to the Jews, the easiest way to do that was to simply deny them possession of a radio with yet another law against German Jews. By April 1941, Jews in all Nazi-occupied territory were ordered to forfeit all wireless radios, in an effort to deny them access to news from the Allies and Dutch government-in-exile broadcasts from London. Although death or deportation (which would likely lead to death) faced those that dared not comply, many took to concealing radio sets behind wall panels and such in order to listen to BBC broadcasts free of Nazi propaganda. Poland: Day 23 of 36 of Germany's Invasion of Poland. Poland: Day 7 of 20 of the USSR's Invasion of Poland. CBI - China: Day 809 of 2,987 of the 2nd Sino-Japanese War. Day 11 of 26 of the 1st Battle of Changsha. ETO - UK: Day 18 of 258 of the Blitz. ETO - UK: Day 76 of 114 of the Battle of Britain. RAF bombers attack industrial targets in Berlin this night. West Africa: British & Free French attempt to capture Dakar fails when the pro Vichy garrison fights back, inflicting damage on the invasion fleet, causing it to abort. East Africa: Day 106 of 537 of Italy's East African campaign in the lands south of Egypt. CBI - China: Day 1,175 of 2,987 of the 2nd Sino-Japanese War. Day 314 of 381 of the Battle of South Guangxi. Day 35 of 42 of the Hundred Regiments Offensive. CBI - Indochina: Day 2 of 5 of the Japanese invasion of Vichy French Indochina. CBI - Indochina: Day 2 of 4 of the Battle of Lang Son. Russian Front - Finland: Day 94 of 164 of the Battle of Hanko. The Soviets will be forced off their leased naval base. Russian Front - Finland: Day 20 of 28 of Finland's reconquest of East Karelia in southern Finland. The Soviets continue withdrawing from Finland back to Leningrad. Russian Front - Finland: Day 87 of 142 of Operation SILVER FOX, a joint German-Finnish campaign to capture the Russian port of Murmansk in the Arctic. The German troops continue withdrawing back into northern Finland. Russian Front - Finland: Day 85 of 140 of Operation ARCTIC FOX, a joint German-Finnish campaign against Soviet Northern Front defenses at Salla, Finland. Russian Front: Day 94 of 167 of Germany's Operation BARBAROSSA, the overall invasion of the USSR. Russian Front - North: Day 16 of 872 of the Siege of Leningrad. Russian Front - South: Day 47 of 70 of the Siege of Odessa, Ukraine. Russian Front - South: Day 32 of 35 of the 1st Battle of Kiev, Ukraine. MTO - Libya: Day 167 of 256 of the Siege of Tobruk. East Africa: Day 471 of 537 of Italy's East African campaign in the lands south of Egypt. CBI - China: Day 1,540 of 2,987 of the 2nd Sino-Japanese War. Day 18 of 33 of the 2nd Battle of Changsha. Russian Front - North: Day 381 of 872 of the Siege of Leningrad. Russian Front - North: Day 142 of 658 of the Siege of the Kholm Pocket, USSR lays siege to the Kholm Pocket but the Germans hold out for a about a year and a half. Russian Front - Center: Day 56 of 64 of the 1st Battle of Rzhev-Sychevka, Russia. Though it will end in a stalemate, it will keep German troops from going to Stalingrad. Russian Front - South: Day 88 of 150 of Germany's CASE BLUE, the failed offensive to take the Caucasus oil fields. Russian Front - South: Day 32 of 165 of the Battle of Stalingrad, the bloodiest battle in human history. Soviet counter-attacks to dislodge the German advance units near the Volga landing stage are unsuccessful. East Africa: Day 142 of 186 of the Battle of Madagascar. British troops occupy the capital of Madagascar. CBI - China: Day 1,905 of 2,987 of the 2nd Sino-Japanese War. PTO - Alaska: Day 109 of 435 of the Battle of Kiska, Aleutian Islands. The US and Canada will defeat the Japanese invaders. PTO - Malaya: Day 217 of 357 of the Battle of Timor Island, a long guerrilla war ending in Japanese victory. PTO - New Guinea: Day 65 of 119 of the Battle of the Kokoda Track. The Australians continue pushing back the Japanese troops. This will become an Allied victory. PTO - Solomon Islands: Day 48 of 187 of the Battle of Guadalcanal. ETO: US 8th Air Force: B-17s hit three airfields in France. Russian Front - North: Day 746 of 872 of the Siege of Leningrad. Russian Front - North: Day 507 of 658 of the Siege of the Kholm Pocket, USSR lays siege to the Kholm Pocket but the Germans hold out for a about a year and a half. Russian Front - Center: Day 48 of 57 of the 2nd Battle of Smolensk, Russia. Becomes a Soviet victory as the Axis are pushed completely away from the Moscow region. Russian Front - Center: Day 38 of 48 of the Battle of Bryansk, Russia. German troops continue evacuating Bryansk. Russian Front - South: Day 31 of 122 of the Battle of the Lower Dnieper River, USSR. The Soviets captures Poltava. CBI - China: Day 2,270 of 2,987 of the 2nd Sino-Japanese War. PTO - New Guinea: Day 5 of 219 of the Battle of Shaggy Ridge. This will become an Allied victory. PTO - New Guinea: Day 2 of 162 of the Battle of the Huon Peninsula. This will result as an Allied victory. PTO - Solomon Islands: Day 40 of 56 of the Battle of Vella Lavella. The Allies will win this one. ETO - France: Day 54 of 284 of the Battle of Brittany. ETO - Belgium: Day 22 of 62 of the liberation of Belgium. ETO - France: Day 9 of 236 of the Siege of Dunkirk. ETO - Netherlands: Day 7 of 9 of Operation MARKET GARDEN. RAF precision bombing raid using 12,000lb bombs, breaches the crucial Dortmund-Ems Canal. Canadians win a bridgehead over the Escaut Canal. ETO - Germany: Day 5 of 145 of the Battle of Hürtgen Forest. ETO: US 8th Air Force P-38s, P-47s and P-51s fly patrols in the Netherlands while B-24s fly more trucking missions to supply gas to Patton's troops. Russian Front - Finland: Day 9 of 223 of the Lapland War. Finland and Russia have joined forces to kick the Germans out of Finland's most northern province. Russian Front - North: Day 7 of 10 of the Battle of Porkuni, Estonia. Russian Front - North: Day 10 of 41 of the Battle of Riga, Latvia. Russian Front - Center: Day 10 of 72 of the Battle into East Prussia and northern Poland. Russian Front - South: Day 10 of 72 of the Battle of Belgrade, Yugoslavia. Russian Front - South: Russian and Romanian troops enter Arad, Hungary. MTO: US 15th Air Force B-17s bomb at Brux, Czechoslovakia and at Wels, Austria. B-24s attack various targets in Italy. MTO - Italy: US 12th Air Force medium bombers attack several railroad bridges in the Po River Valley. CBI - Burma: Day 176 of 302 of the Chinese Salween Offensive in Burma. CBI - China: Day 2,636 of 2,987 of the 2nd Sino-Japanese War. Day 160 of 259 of Japan's Operation ICHI-GO. PTO - New Guinea: Day 284 of 597 of the Battle of New Britain. PTO - New Guinea: Day 155 of 481 of the Battle of Western New Guinea. PTO - Palau Islands: Day 9 of 74 of the Battle of Peleliu (Operation STALEMATE II). PTO - Palau Islands: Day 7 of 36 of the Battle of Angaur.